Why is a US university launching Chinese language broadcasts of its football games? Home › Knowledge Center › Why is a US university launching Chinese language broadcasts of its football games? 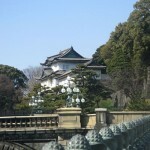 During each match, the university broadcasts an online commentary of the match purely in Mandarin. Attendances have been falling at the matches, so the idea is to target the large number of overseas students from China who are currently studying at the university. The numbers clearly demonstrate why this is a shrewd investment and will help the university improve integration. There are over 5000 students from China at the University of Illinois, which has around 44,000 students in total. 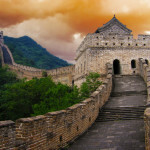 InsideHigherEd.com states that the university enrolled just 37 undergraduates from China in 2000 and enrolls 2,898 today. At the graduate level, there has been a threefold increase in enrollment from 649 in 2000 to 1,973 in the autumn of 2014. Nationally since the year 2000, there has been a fivefold increase in the number of Chinese students studying in the US. Two Mandarin students currently host the broadcast. When the broadcast first launched they ran into a fundamental translation problem when they realised there are no Chinese words for some of the sport’s terminology, such as Touchback. Now, they simply use the English words instead and hope their audience can understand them. They have also set up a social media site, which has around 50 active members, who comment on the broadcast during the game. While it is thought to be the first time a university in the USA has broadcast a football match in Mandarin, it is not the first foreign language broadcast. The University of Texas runs a similar project running a Spanish translation service for Spanish-speaking students. The crowd listening online numbers about 50 based on the feedback Lu and He are getting on WeChat, a Chinese-language social media site where they’ve set up a group for listeners. They both occasionally glance down at brief comments and questions scrolling on the computer monitor that sits in front of Lu as they work. 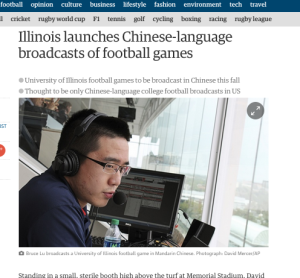 Pingback: Why is a US university launching Chinese language broadcasts of its football games? Is it difficult to find qualified Sinhalese translators? Translate English to German? Here’s your German Translators Team! Looking for Spanish translations? How many countries speak Spanish? Looking for English Vietnamese translators?